We all experience stress, a feeling of being pressured or overwhelmed, from time to time. Sometimes feeling stressed only lasts a few minutes or hours -- and either the stressor is relieved, or we successfully use our coping strategies to reduce our feelings of overwhelm. And there are other times when we’re under a high level of stress for weeks or months at a time. When this happens, we need some extra coping strategies to help us through these periods of intense stress. An extended period of stress can be the result of a particularly busy time at work or the end of a relationship or the arrival of a new baby. Sometimes these times are predictable and recurrent, such as the winter holiday season or back-to-school time for teachers and students. And, of course, sometimes life throws us a curve ball like when a family member dies unexpectedly or we have to move with little notice. Anytime we’re extra busy, have added demands on our time, energy, and finances, and all kinds of changes (both positive and negative) can feel overwhelming. Of course, what feels stressful varies from one person to the next, but we certainly all experience times of high stress. 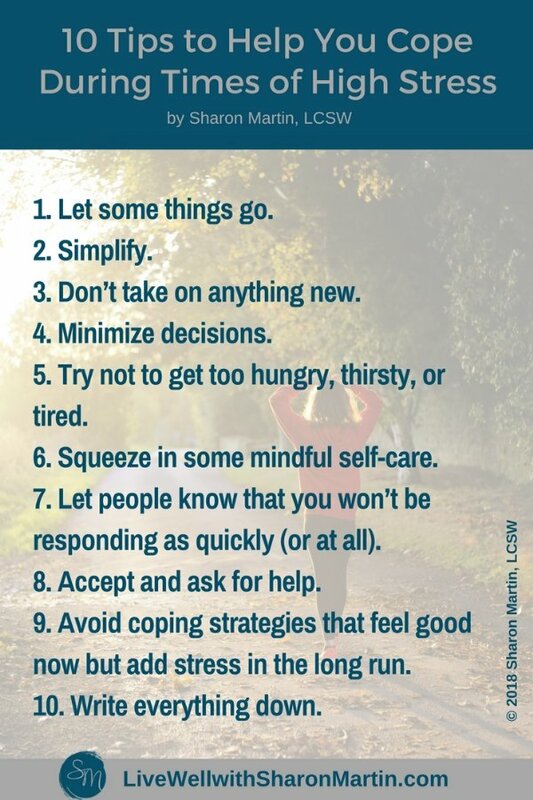 Below are ten stress management tips that may be helpful to you during an extended period of stress. Not all of them may be a good match for you. Feel free to use those that work best for you and alter them to meet your needs. These tips are just intended to give you some ideas, so that you can decide what strategies will help you navigate a “season of stress”. Let some things go. When you’re experiencing an intense period of stress, some things are simply not going to get done; you don’t have the time and energy to keep up with everything you’ve been doing. If possible, hire help and automate as much as you can, but there will probably still be things that you can’t keep up with. So, there’s no need to criticize yourself if your lawn doesn’t get mowed or the laundry piles up. Sure, it’s not ideal, but sometimes your focus needs to be elsewhere. Simplify. Because your resources are already stretched thin during a time of stress, you need to be selective about what you spend your time and energy on. So, it helps to keep things as simple and routine as possible. For example, many people appreciate the simplicity and decision-free strategy of eating the same thing for breakfast every day or having a seven-day menu that they rotate. This eliminates extra decisions and makes shopping and meal prep easier. Don’t take on anything new. Boundaries are essential during a period of stress. You may need to decline social invitations and say no to additional responsibilities at work. It’s also not a good time to ask more of yourself, such as starting a new diet or quitting smoking. 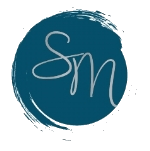 During times of stress, we want to focus on doing what’s absolutely essential – and that’s it! The rest will have to wait or someone else will have to do it. Minimize decisions. Have you heard of decision fatigue? It basically means that decisions take mental energy and the more decisions you make, the more energy you expend. So, it makes sense that when you’re overwhelmed and stress, it’s helpful to eliminate as many decisions as possible. This can be small decisions like what to eat, as I mentioned earlier, or big decisions such whether to move or quit your job. To the extent that’s possible, try to minimize decisions by keeping things simple and routine and postpone making big decisions until you’re more calm, rested, and centered. Try not to get too hungry, thirsty, or tired. When your basic needs are met, everything else runs more smoothly! I think most of us start getting irritable and unfocused pretty quickly when we’re hungry and tired. Dehydration is harder to spot but can definitely negatively impact your mood and energy as well. Keep a supply of healthy snacks and water in your bag, desk, and car so you always have them handy. If possible, keep consistent sleep and wake times and if you need a nap, try to take one! Squeeze in some mindful self-care. Unfortunately, self-care is one of the first things to go when we’re under stress. Our schedules get turned on their heads and we stop going to the gym and seeing our friends -- just when we need these restorative activities the most. It may not be realistic to keep up with all the self-care activities you’ve been doing, but you can usually make time (even 15 minutes per day) to purposefully do something that feels good and is healthy for you. It could be a brisk walk outside, listening to your favorite music, or fifteen minutes just sitting quietly on your porch. Let people know that you won’t be responding as quickly (or at all). Responding to people’s questions and even their well wishes can be exhausting. If you’re not up to it, don’t feel obligated to return every text or email that you get. Instead, mute your phone and put a message on your voicemail and an autoresponder on your email letting people know that you won’t be responding for a while. Responding when you want to rather than on someone else’s timeline is one little way to feel more in control and minimize distractions. Accept and ask for help. Accepting help is tough for a lot of people. Most of us are more comfortable giving help than receiving it. But contrary to popular belief, asking for help isn’t weak; it’s a wise thing to do when you’re running on empty. Accepting your friend’s offer to pick up your kids from school or sit with you during a medical procedure isn’t going to solve all your problems, but it can make a significant impact. Practical and emotional help relieves stress and helps us feel less alone. Being vulnerable, as we do when we ask for help, can also strengthen relationships; it allows others to better understand us and our feelings. And don’t forget that other people like to help, too. So, don’t rob them of this opportunity to be supportive. Avoid coping strategies that feel good now but add stress in the long run. Of course, we all know that overeating, smoking, drinking, and excessive amounts of caffeine aren’t healthy ways to cope with stress. I think it’s natural to occasionally seek comfort in these ways and beating ourselves up over using some unhealthy coping strategies will only add another layer of stress. We do need to be thoughtful about how much we’re relying on strategies that feel good at the moment, but cause us more problems in the long-run, and try to keep them to a minimum. Write everything down. When we’re under stress, our short-term memory is taxed as well. You may find it’s hard to recall the instructions your doctor just gave you for a new medication or when your next appointment is. Although this is frustrating, it’s completely normal. Your attention is being pulled in a lot of different directions and your brain is flooded with stress hormones. Do yourself a favor and write everything down from the important to the mundane. Keep a notebook in your purse, use a note-taking app on your phone, record voice memos, or take photos of basic things like where you parked the car or which kind of yogurt your mother asked you to bring her. 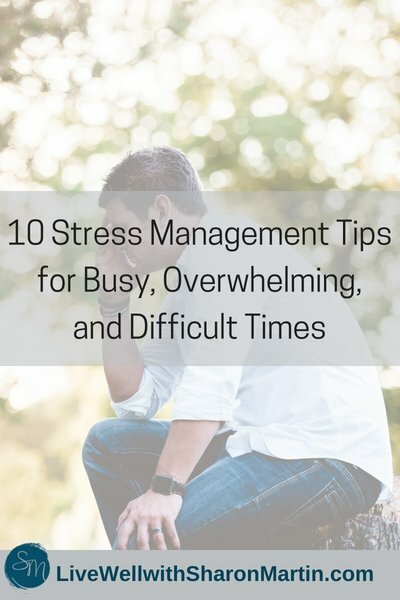 I hope that some of these stress management tips will be helpful when you’re experiencing an extended period of stress. Above all else, I hope you will be kind to yourself, recognizing that when you’re going through a difficult time, you need extra TLC and self-compassion because you won’t be able to do everything perfectly. Do the best that you can and let that be enough!